Home » What are the 4 Elements of Negligence? In law school, students are taught that there are 4 elements of negligence: duty, breach of duty, damages, and causation. Essentially, you can bring a lawsuit for negligence if the defendant had a duty to be careful around you, the defendant breached that duty of care, you suffered injury, and the defendant’s conduct was the proximate cause of the harm. However, anyone who has practiced law in the Commonwealth of Pennsylvania knows that proximate cause can be separated into two parts under certain circumstances. The causation element can sometimes consist of two parts: proximate causation and actual causation. In this article, we will attempt to explain the difference. As explained by the Pennsylvania Superior Court in Reilly v. Tiergarten, “proximate cause is a question of law, to be determined before the question of actual cause may be put to the jury. which the judge must decide.” The question in Reilly was whether the defendant’s actions were so remote that it should not be held responsible for any injury caused to the minor plaintiff by the police. In the Reilly case, a minor was served alcohol at a tavern in violation of state law. When he got home, he assaulted his father with a knife and the police were called to the scene. When the police arrived, the armed minor was shot by the police officers. A lawsuit was brought against the tavern for the shooting injuries received by the minor. The court held that the claim of negligence against the tavern for serving liquor to a minor was so remote with respect to the injuries latter received as a result of the shooting that the tavern could not as a matter of law be held legally responsible and, therefore, granted summary judgment and dismissed the case. The key test is whether the injury the defendant suffered would have been foreseen by an ordinary person as the probable and natural outcome of his conduct. If not, then the defendant cannot be held responsible for the injury. In Reilly, the court held it was not foreseeable that a minor served liquor would go home, assault his father with a knife, and then be shot by the investigating police. But imagine that a person was carrying groceries into their house when the bag tore open. Soup cans rolled out into the road, causing a driver to swerve and strike a pedestrian. In this case, would the average person have foreseen that someone would get hit by a vehicle because they lifted a bag of groceries out of their vehicle which later ripped? The answer is certainly “no,” so this person cannot be a proximate cause of the accident—even if the accident would not have happened but for their carrying the bag of groceries. Proximate causation raises important policy considerations. What conduct should courts hold responsible for injuries and which conduct is too remote? An attorney can help analyze this situation. Once a judge decides proximate causation, the jury will decide actual causation. Actual causation is fairly simple: did the defendant’s conduct substantially contribute or was it a factual cause of the defendant’s injuries? In many cases, the answer is obvious. For example, if you were T-boned in an intersection by a speeding motorist and broke your shin bone when it slammed into the dashboard, then the driver’s reckless conduct clearly contributed to your broken bone. However, there are some situations where actual causation could be in dispute. For example, you might have had a pre-existing injury to your back when you fell while skiing. After a car accident, you might claim that your back has been hurt in the crash, but the defendant could allege that you really hurt your back while skiing. A jury will need to decide whether the accident was the actual cause of the back injury. Medical malpractice cases are another situation where actual causation is often in dispute. 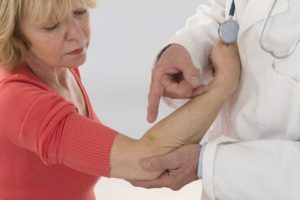 If a doctor prescribed the wrong medication and you developed a tumor, then an expert witness will probably need to testify to connect the doctor’s error to your health issue. These complicated issues are outside a jury’s understanding, so expert testimony on actual causation is required. We hope you have enjoyed this short article on the four elements of negligence. Accident cases are very confusing, and injured victims need confident legal guidance during this turbulent time. As medical bills arrive in your mailbox, you might be wondering whether you can hold the person who injured you accountable. The good news is that you can. At PhillyLaw, we have brought many lawsuits on behalf of innocent victims injured or killed as a result of medical malpractice, defective products, car/truck accidents, slip and falls, and other serious accidents. We are a full-service personal injury law firm with more than 40+ years of experience. Contact us today. We will be happy to get to work on your case immediately, but you need to contact us first. Please call PhillyLaw at 215-515-2050 or submit an online form for a free consultation with one of our Philadelphia personal injury attorneys.